May 4th is Star Wars Day! 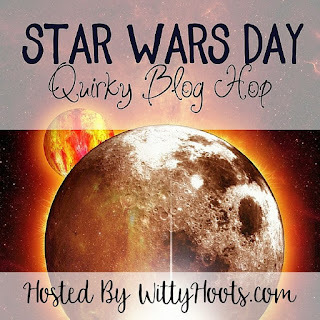 I'm so excited to be participating in the Star Wars Day Quirky Blog Hop hosted by Witty Hoots. 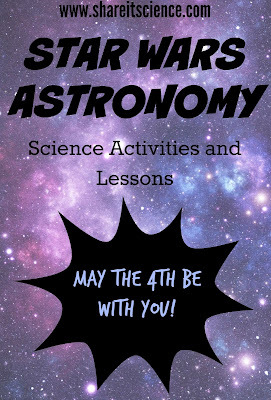 Get ready for some Star Wars inspired STEM! Have you ever wondered what our planet would be like if we had two suns like the planet Tatooine? What if we had two moons? Are the planets in the Star Wars movie realistic at all? Let's answer those questions and have some fun with some hands-on science activities! You may have observed that Luke Skywalker's home planet, Tatooine, had two suns. Astronomers have found evidence of a planet outside of our solar system that is orbiting two stars. This planet, Kepler-16b, is part of a system much like George Lucas's fictional planet, Tatooine. On Earth we have one sun, that provides us with light and heat. It holds our planet in orbit. It affects the seasons on Earth. How would this change if we had two suns? If Earth were like Kepler-16b we'd experience slightly colder temperatures because we'd be at a greater distance from the sun. Kepler-16b's suns are slightly smaller than our sun, so the pull of gravity would be less and we'd have a longer year because we'd orbit more slowly. If we had two suns the same size as our sun, then we'd have a faster orbit and a shorter year. Scientists aren't sure if a moon would form in this type of system, so our nights would be a little bit different, and the ocean tides would be affected. Try this activity from NASA that models the rotation of Earth and the night/day cycle. You'll need a globe (or a large ball) and a flashlight. Once you've tried this out under "normal" circumstances for Earth, try it again with two suns, or in other words, two flashlights. How does this change where the people on Earth are experiencing daylight? Does it make the days longer or shorter? What effect do you think this has on the seasons? How might the human sleep cycle, or circadian rhythm be altered by having two suns? Would other animals and plants be affected too? What would our planet be like if there were two moons rotating around it? Earth is the only planet in our solar system with just one moon. Some planets do not have any natural satellites, whereas others have dozens. Our moon and its gravitational force gives the ocean its tides, is the reason we have a 24 hour day and it keeps the planet at the tilt that gives us seasons. The moon reflects the sunlight in the night time and we can view its phases and eclipses. How would all of this be different if we had two moons? Try the "Dance of the Moon and Oceans" as a movement activity with several kids to learn about the tides. How would this movement change if there were more than one moon in this "dance"? If you do not have a group of kids to try this with, you can learn about the tides through this video. How would having two moons change how our tides work? How would more extreme tides affect life on Earth? What about the moon's phases and eclipses? Would we still see the moon the same way if there were two of them? Now add in another moon. You might have to find a friend to help. Experiment with where you place the moon. Have the moon's phases changed? How is this affecting the night sky on the Earth? What if one moon were orbiting faster than the other? How would that change things? Are there other planets that resemble the fictional ones in the Star Wars universe? Yup. But they aren't in our solar system! Exoplanet OGLE-2005-BLG-390Lb resembles the fictional cold world planet, Hoth. Mustafar, a hot molten world in Star Wars is similar to Kepler-10b and Kepler-78b. Kepler-22b is thought to be like the fictional ocean world, Kamino. It is also believed that there are real-life similarities out there to Princess Leia's home planet, Alderaan and to Endor, home of the Ewoks. Universe Today: What if the Earth had two moons? Join us as we celebrate Star Wars Day - May 4th with some wonderful galactic inspired crafts, recipes and activity ideas! 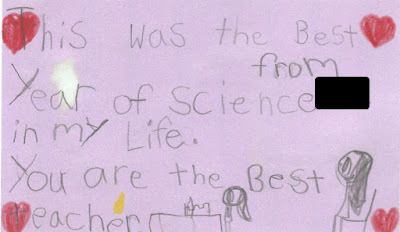 As a teacher, what I wanted the most was to know that I had made an impact on my students. I wanted to know that the time in the classroom and the work I took home each night had been worthwhile. Every day you work towards meeting your students' various needs and helping them learn and grow. Sometimes it is impossible to know how you have impacted their lives. May 3rd is Teacher Appreciation Day, so you might be considering giving a special teacher a gift. Here are some thoughts on what will be most appreciated from my experience as a teacher. The best teacher gifts I have ever received, the ones that end up in a scrapbook or memory box or sit prominently on a shelf, are those that are personal and come from the heart. Sure it's nice to get chocolate, or a new notepad, but a hand written note is really something that leaves an impact. These are my most treasured gifts, notes from students and parents. What was your most favorite thing you learned in Mrs. or Mr. _____________ class this year? Why do you like Mrs. or Mr. ________________ as a teacher? What is something that Mrs. or Mr. ________________ does that makes you feel special? Why is this your favorite subject? What is the funniest thing that happened in class this year? 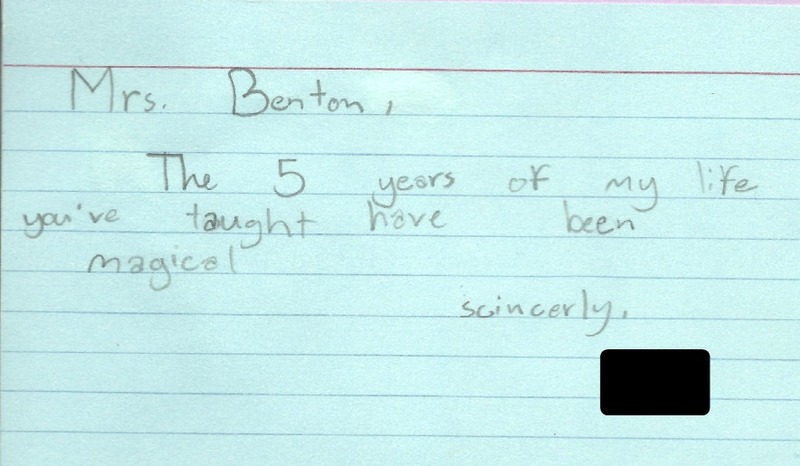 Even grown-ups appreciate the teachers they had when they were students. Check out this great series of letters: "Dear Teacher, You Made A Difference!" If you'd like to purchase a teacher gift, remember to make it personal. Teachers have a lot of students through the years. Most likely they aren't in great need of another mug that has an apple on it. Try to get a sense of what your child's teacher is interested in. Kids are usually pretty observant when it comes to knowing what a person likes! Some of my favorite personalized purchased gifts like this have been from families who recognized my love for plants, or that I really do love geeking out on science stuff. One year I got this Giant Sequoia tree-growing kit. Another year some of the silly plush microbes from the "Giant Microbes" collection. One of my most favorite "teacher" themed gifts was the sweet little book, "Thank You: A Book for Teachers" by Sandy Gengras, it really captures the classroom experience in some short text and sweet illustrations. Also keep in mind that teachers have often spent money out of pocket to provide school supplies for their classroom. A gift card for a retailer where they can get just about anything, like Amazon or Target, a local restaurant, book store or their favorite coffee shop is generally appreciated. Good luck with your teacher appreciation gift! Just remember, it's not about how much you spend, even a few thankful words at drop-off or pick-up time can make a huge difference. 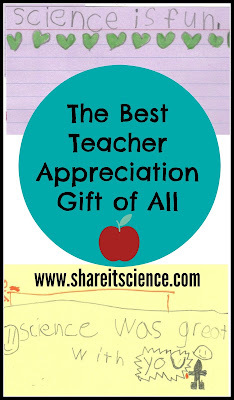 Check out what other great bloggers are saying about Teacher Appreciation! Like what you're reading? Don't miss another post from Share it! Science News. Sign up to receive an e-mail whenever we publish a new post. 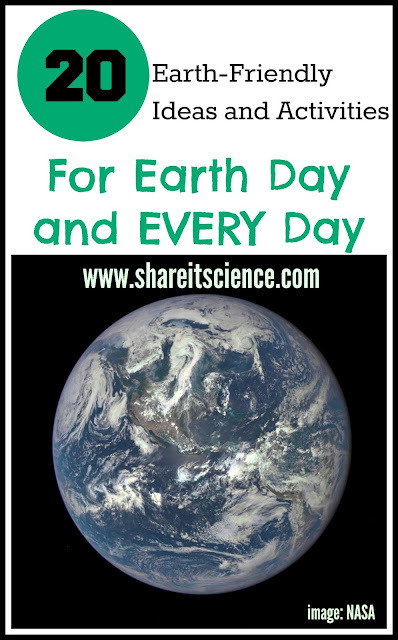 Earth Day is April 22nd, but you can celebrate and care for our wonderful planet every day of the year. Here are over 20 different activities and ideas from Share it! Science to get you started. Reduce, Reuse, Recycle and Conserve! 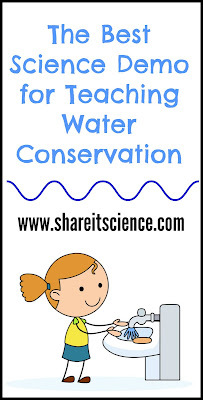 Teach water conservation with this hands-on demonstration, it will blow your mind! 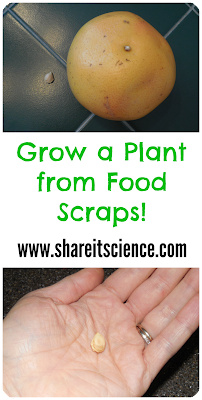 Did you know worms can recycle your food scraps? Learn how to build a worm composter here! 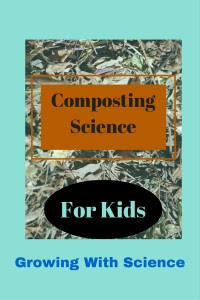 Hop on over to the Growing with Science blog to study decomposition and compost creatures. Great activities and some awesome pictures of "nature's recyclers"! 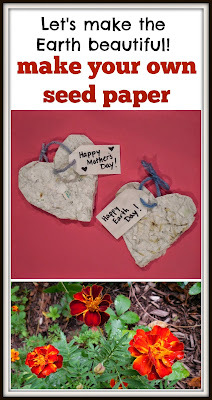 Learn how to recycle paper into seeded paper that you can plant! Makes a great gift too! "Here Comes the Garbage Barge" Inspired Landfill Model. 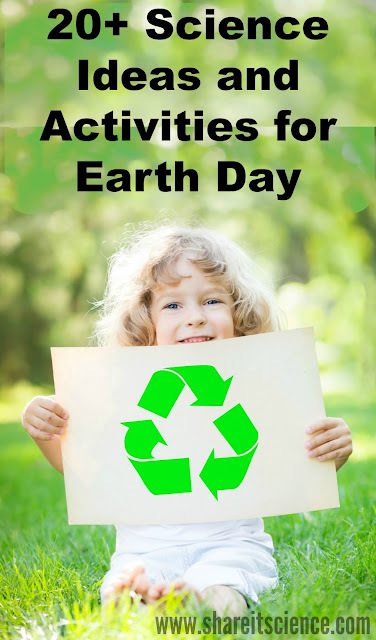 Learn more about conservation by investigating trash and landfills with a story and activity. 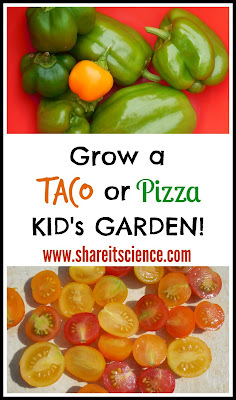 Get kids involved in gardening by growing a taco or pizza themed garden. Ideas here! 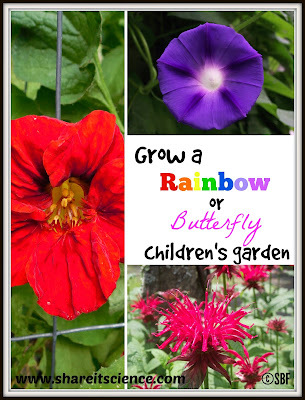 Involve your kids in the garden by growing a rainbow garden or a pollinator garden. Not only fun, but a great learning experience as you attract butterflies and other insects to your yard. Did you know you can grow a new houseplant from an avocado pit? Find out how. Avocados aren't the only houseplant you can grow from the bits left behind by fruits and veggies. Check out these ideas. 25 weeks of my "Glimpse of the Garden" series. 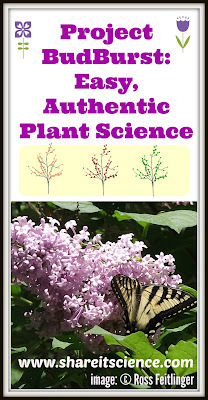 Lessons in gardening, insect and plant science along with anecdotes of a garden season. April 16th, 2016 was the first National Citizen Science Day! Learn how people just like you can get involved in science research projects around the United States. Learn about some fun insect citizen science projects, like the Lost Ladybug Project and Firefly Watch. 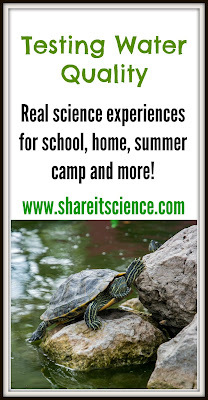 Stay involved in science all summer long! Easy ways to test the water quality in your area. Activity suggestions for home scientists, school, camp or after school programs, etc. Do you love getting kids outside? Project BudBurst is a great way to get kids of all ages involved in citizen science, honing observation skills and developing a stronger sense of place. Easy to incorporate at home or school! 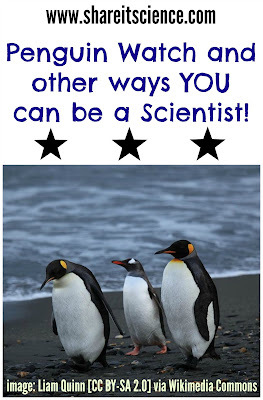 Penguin Watch and Other Ways YOU Can be a Scientist! Lots of ideas for getting involved in citizen science, including helping scientists look for penguins- right from your computer! 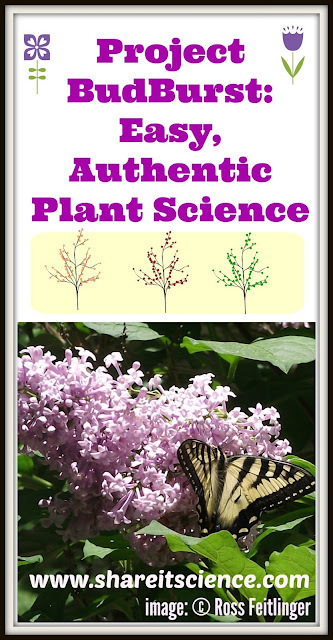 Learn all about pollinators through this lesson in the National Science Teacher's Association series, Picture-Perfect Science. Hands-on STEM about a very important topic! 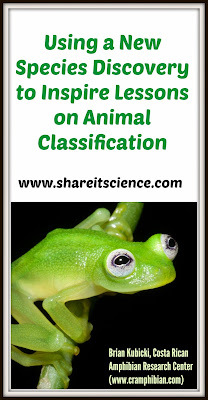 Investigate animal classification by learning about a new species of frog! Ideas here for Preschool through High School. 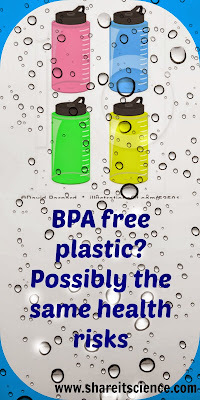 Learn the research between BPA and BPA-Free plastics, with links to lessons on plastics and materials science for students. 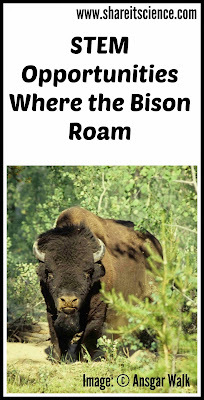 Learn about the reintroduction of the Wood Bison in Alaska, a once locally extinct species. Incorporate this project into an awesome STEM lesson. Invasive Species- On Your Plate! 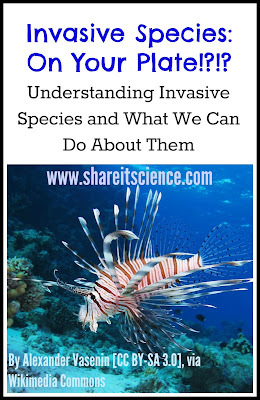 Learn all about invasive species and what some people are doing to try to help eradicate them! 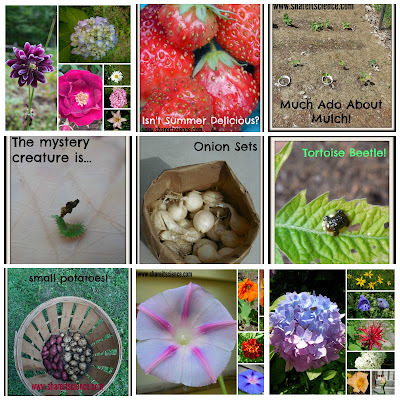 Learn more about plants and animals with these posts on my adventures in nature! Have you ever seen a black colored gray squirrel? Do you know what a gall is? Learn here! Like what you're seeing? Don't miss another post from Share it! Science, subscribe by e-mail! I'm excited to share some thoughts on science in the Pre-school and early Elementary years today in addition to introducing you to Rozzy and Friends whose work focuses on this age group. Rozzy and Friends is an educational company whose aim is to bring STEM (Science, Technology, Engineering and Math) experiences to young children, particularly girls, ages 2-6. 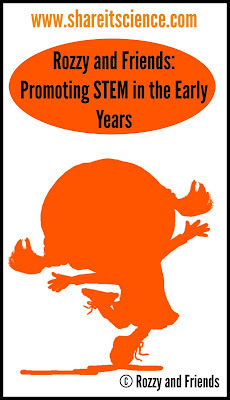 Exposure to STEM is just as important as language arts in early childhood education. The ideas that are inherent in STEM concepts and future careers in STEM fields are innate in young children: curiosity, creativity, collaboration and critical thinking. In addition to developing and bringing STEAM (STEM plus Art!) curricula to schools, Rozzy and Friends has also published a book to engage young students in the scientific process. Maggie the Magnifying Glass is the story of a young girl who has a pretty magical adaptation: she IS a magnifying glass. Throughout the interactive story, Maggie describes how she makes scientific observations to find their lost class pet, a ladybug. I particularly like how the book begins with a place to write the owners name. It says: "This book belongs to Scientist: _________________". Insuring from the get-go that the reader understands that they are a scientist too. The book depicts a wide range of characters that just about any reader could relate to. I enjoyed that the text was interactive, in that statements are written to promote children's thinking and teach them how they might investigate something scientifically. The student's teacher Miss Rozzy suggests they think like scientists when their ladybug goes missing. They need to ask questions and use tools, like magnifying glasses. From then on, the kids are guiding the investigation, not the adults. The book ends with Maggie's tutorial on how to use a magnifying glass. I did find Maggie's magnifying glass face to be a little off-putting, but that might just be me as an adult over-thinking things! I think that students might find her super power exciting, but I also believe that having a strong, young female character who was interested in using scientific tools would be just as engaging to young girls, regardless of super power. 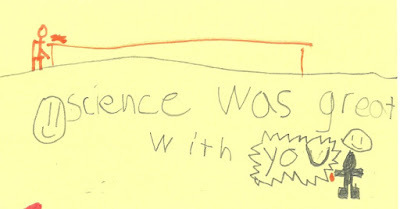 That caveat aside, I think that Rozzy and Friends is on the right track in terms of depicting children engaged in the scientific process, particularly girls, and promoting the idea that we are all scientists. To learn more about Rozzy and Friends and to see their engaging school programs in action, visit them on Facebook, Twitter, and Instagram. To learn more about their STEAM curriculum contact them through the Rozzy and Friends webpage. If you are interested in buying copies of Maggie the Magnifying Glass for your children or classroom they are available for purchase here. Many preschool activities lend themselves conveniently to STEM. Students are naturally curious and in a stage where they are developing an understanding of the world around them, often through experimentation. More and more excellent resources are being developed to aid in formalizing STEM education in schools and at home. 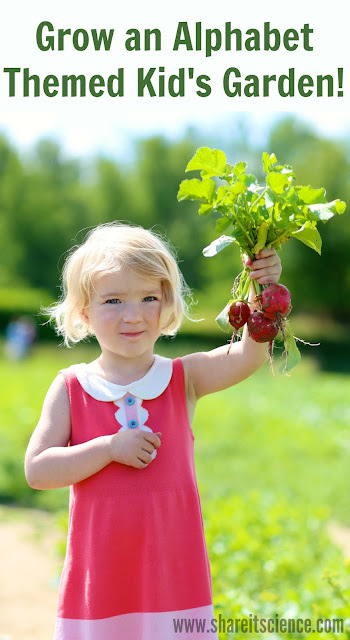 If you are interested in promoting STEM learning with your young students or children, you might want to check out the resources from Bright Horizons, or the Boston Children's Museum's Preschool curriculum: STEM Sprouts. In addition to some excellent programming depicting kids who take part in the scientific process, like Sid the Science Kid, PBS has some excellent tips for encouraging girls in STEM found here. You may also want to read my post, "Science Teaching Toolbox: Girl Power! Getting (and keeping!) Girls Interested in Science." Note: I was sent a complimentary copy of Maggie the Magnifying Glass but was not otherwise compensated for this post. All opinions throughout are my own. What exactly is citizen science? Citizen science is when scientists collaborate with the general public in collecting data and making observations. There are a myriad of projects available from field work to online activities that broaden the abilities of professional scientists by using the collective power of the public. Citizen science is an excellent way to connect kids to authentic science in the classroom, through after-school programs, or camps. To learn more about Citizen Science Day events near you, check out this calendar from Discover magazine or this calendar from SciStarter. For some FAQ's on how to plan or participate in an event, check out this page. 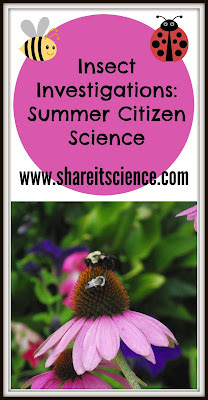 Citizen science has been a popular topic here on Share it! Science News. We've featured many different projects that are fun and easy to participate in. We especially like Project BudBurst because it is a project anyone can do, and there are many resources available for students and teachers. You can also get younger kids started with their BudBurst Buddies program. Project BudBurst collects plant phenology data. While this might sound complicated, it's not! Phenology is the study of cycles and seasonal phenomena. When you participate in Project BudBurst you observe plants in your area for seasonal changes, such as budding, bud burst and flowering, then report your observations online. We've been fortunate to team up with Project BudBurst twice now for giveaways, and are excited to have you get involved this year. For more information about the program, check out our post: "Project BudBurst: Easy, Authentic Plant Science"
How can kids participate in Citizen Science? Enter to win a Learning Pack from Project BudBurst! 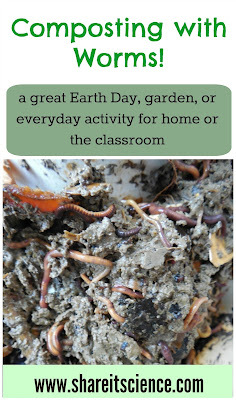 These are materials that would benefit any classroom or home citizen science project! 4 different winners will each win: 2 notepads, a Project BudBurst calendar, Season Spotter bookmark, scientist trading cards, plant profile trading cards and a tape measure for field work. This giveaway runs from April 12th-Midnight EST April 18th. You can enter in a variety of different ways in the Rafflecopter box below. Winners will be notified by e-mail and included in this post once the giveaway concludes. Good luck and have fun being a scientist! I am so pleased to be reviewing a science lesson from one of my all time favorite teaching series, Picture-Perfect Science. The Picture-Perfect Science series, written by Karen Ansberry and Emily Morgan combine NGSS aligned inquiry science lessons with fantastic children's picture books. I first stumbled upon this series from the National Science Teacher's Association when I was teaching and developing science curriculum for Pre-K through 6th grade. I was already using different children's books to connect my elementary students with science ideas and concepts and thought it would be a great idea if more people did so. While lamenting the fact that there weren't more resources available for this, I found Picture-Perfect Science in an National Science Teacher's Association (NSTA) catalog. Low and behold I was not the first one to think of such a thing! There are several different Picture-Perfect Lesson books (details on each below) spanning from grades K-6. The lesson I'll be looking at in more depth today is called "Flight of the Pollinators" and is included in Picture-Perfect STEM Lessons K-2: Using Children's Books to Inspire STEM Learning. This timely lesson about pollination and how plants and animals mutually benefit from it is not only engaging, but also informative. 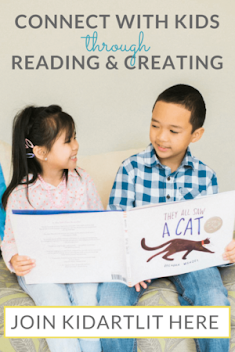 Each Picture-Perfect lesson utilizes 2 different children's texts, one written in a narrative style, and another in a non-narrative informative style. "Flight of the Pollinators" introduces students to the beautifully illustrated and written, Flowers are Calling by Rita Gray and illustrated by Kenard Pak and What is Pollination? by Bobbie Kalman which is filled with excellent photographs, diagrams and clear informative text. The lesson is clearly laid out so that seasoned science teachers and those with less confidence in the sciences can easily engage students in the lesson. A suggested daily schedule using the 5 E inquiry instructional model is laid out for each lesson. 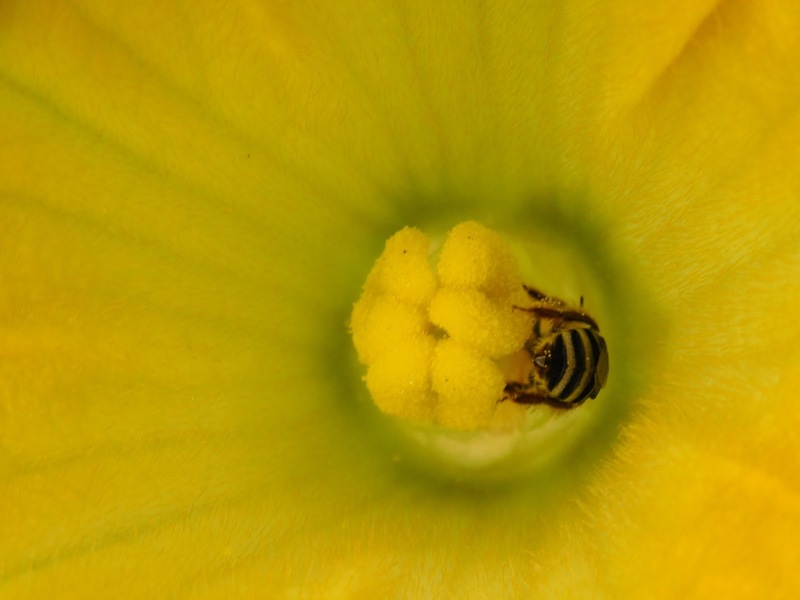 Additionally, information on standards that apply to the lesson and background information on the topic of pollination are offered. "Flight of the Pollinators" engages students by reading Flowers are Calling, and then allows them to explore flowers by investigating examples in a hands-on way. After students have had an opportunity to explore flowers on their own, instructors move on to the explain portion of the lesson, giving information and context by reading aloud What is Pollination. Picture-Perfect Lessons always include discussion questions to use during read alouds. 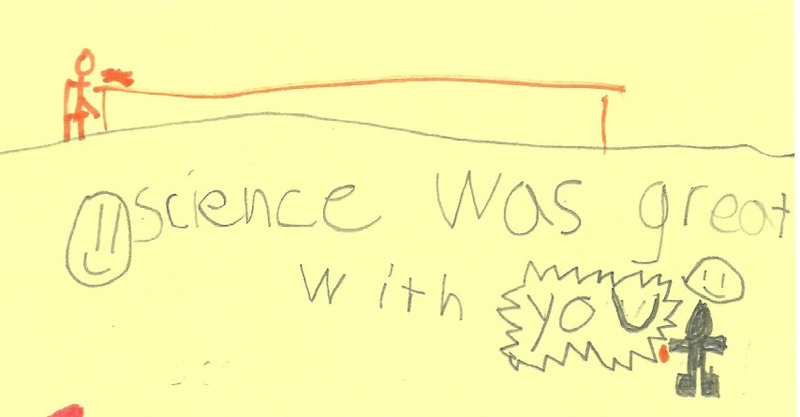 These truly engage students with the story and help to solidify science information. Students then complete a cloze activity for reading comprehension. My favorite part of this lesson is the elaborate portion, where students are asked to design their own pollinator. This activity not only helps students move toward the Next Generation Science Standard performance expectation for second grade: "2-LS2-2 Develop a simple model that mimics the function of an animal in dispersing seeds or pollinating plants", but also engages their creativity and imagination. Students practice research skills to choose a real pollinator that they would like to model. Then they are challenged to design their pollinator in a way that achieves the task of moving "pollen" (pom poms) from one "flower" (cup) to another "flower" (cup). A link to a clip from the incredible movie, Wings of Life, is included so that students can actually see pollinators doing their work. "Flight of the Pollinators" wraps up by evaluating students through a presentation of their pollinator. Rubrics are always included in the student pages section of Picture-Perfect lessons, and these are easy to follow guidelines for students and teachers on what is expected during their project or presentation. Students present for their class or make a video presentation. Their presentation includes a demonstration of how their pollinator moves from one flower to another, a description of the pollinators body parts (specifically how the pollinator gets food from the flower and the body parts the pollen sticks to), an explanation of how pollinators and plants benefit from pollination, and finally an explanation of how humans benefit from the process. My favorite feature of this new lesson is the "STEM at Home" letter in the student pages. Although I've seen reproducible letters to send home that sum up lessons in other curriculum books, I absolutely love the way this one engages the student in the process. Students fill in the blanks of the form letter for who it is addressed to, and fill in "I learned that:___________" and "My favorite part of the lesson was:__________". Additionally the letter offers a web link to a video that can be watched at home on how engineers are designing robotic bees to pollinate flowers. The last portion of the letter is a place for the student and their home caregiver to sketch what their robot pollinator might look like if they built one together. I found this to be an excellent addition to the lesson, because it gives the teacher one last assessment and check-in to see what the student learned in the lesson, and it allows the student to engage someone at home directly. This tactic is much more likely to result in a shared STEM experience at home, rather than simply sending home a photocopied generic form letter. I truly believe that the Picture-Perfect Science series books are an invaluable resource to any elementary science teacher or homeschool family! Check out these editions and find the one that is best for you. They are the perfect way to integrate literacy and authentic inquiry science. 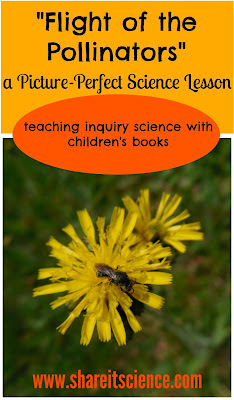 Even More Picture-Perfect Science Lessons - Using Children's Books to Guide Inquiry, K-5. If you are an NSTA member, which I also highly recommend, you can purchase these books and tons of other great titles for teaching science, at the member discount. NSTA membership also includes many other great perks like journal subscriptions, excellent professional development (like Picture-Perfect Science Workshops!!) and a networked community of excellent educators. It is important to note, however, these books are not just great for science teachers. These lessons can easily be used for homeschooling, after school programs and library programs. Do you know a parent or educator who might be interested? Pass along this post! 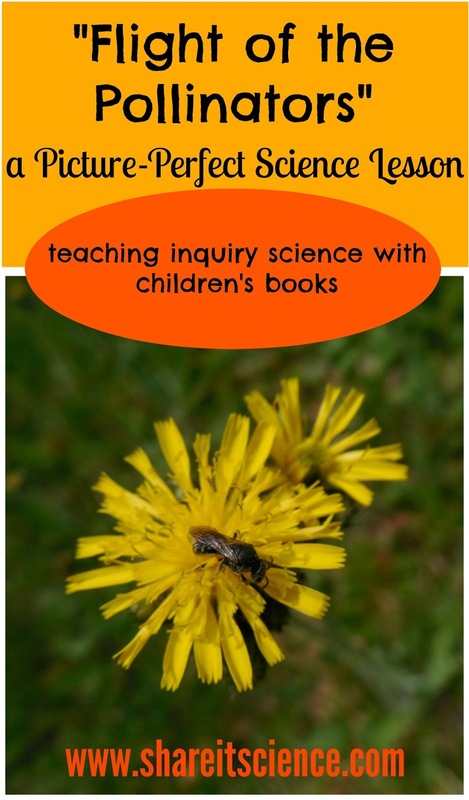 If you are interested in other science activity ideas that link to children's books, check out my post: The Dandelion Seed: Design a Seed Engineering Challenge that was part of the Storybook Science blog series. This is an entire month of children's book inspired science activities! Before you go, you might also want to check out author Emily Morgan's series "Next Time You See". These are awesome children's books on exploring, observing and learning about nature. They'll make you look at things differently and more closely next time you are outdoors. Click the images below for more details.